Here at Apprising Ministries I’ve been covering the inroads into evangelicalism being made by “trinitarian-modalist” and Word Faith prosperity preacher T.D. Jakes, even though James MacDonald Was A Bit Late In Mainstreaming T.D. Jakes. Last time out in T.D. Jakes Hawks New Self-Help Book I told you about a recent book signing for his latest man-centered manifesto, Instinct: The Power to Unleash Your Inner Drive, at Books & Greetings in rather out of the way Northvale, NJ . Yesterday the venue seemed more like it for the mega-millionaire “Bishop” as he appeared once again for Oprah’s Lifeclass. He was there not long ago as well as I showed you in Oprah Winfrey’s Lifeclass and Elephant Room 2’s T.D. Jakes. Following are a couple of clips from the program yesterday where professing Christian Oprah Winfrey1 featured the high-profile WF minister T.D. Jakes. We begin with Pt1: Oprah’s Lifeclass—First Look: Never Settle for the Status Quo. Oprah starts off by quoting how Jakes has said we should never settle for the status quo, thus opening the floor for him to elaborates to what he means. All we get, however, is the usual self-help hooey we’d expect from every other guest on Oprah’s programs. As Jakes talks about getting out of “the cage,” which he could’ve used to illustrate sin, he fumbles a great opportunity to bring up the Gospel that he’s supposed to preach. After-all, with Winfrey, Jakes is with someone who likes to talk about God. 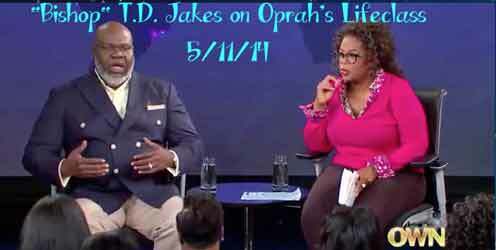 Now you’ll see Oprah asking Jakes what his “process for tapping into” his “instinct” is like. This would have been a great place for T.D. Jakes, whom the audience perceives as a Christian pastor, to talk about the importance of seeking the will of God first. Indeed, such as man-pleasing myths of mere trivial tripe a la the saccharine self-esteem messages that T.D. Jakes has since adapted from Robert Schuller, his dutiful disciple Rick Warren, and even that of Jakes’ good friend—and fellow WF mogul—ol’ smilin’ Joel Osteen. And with T.D Jakes being so popular among the Evangelical Ecumenical Magisterium2 comprised of multi-site vision-casting propeht-pastors like Steven Furtick and Ed Young, Jr., it gives us real reason to wonder about their discernment and that of those aligned with them.